The Workshop by Latitude inhabits a storefront on Roncesvalles previously home to the Fat Cat Wine Bar . Still owned by executive chef Mathew Sutherland, the new casual concept has already been tried and tested - the original location is still successfully operating in Georgetown. The 40-seat floor plan remains more or less the same as the previous iteration, though the aesthetics have been refreshed with new paint and furnishings. Centre stage is the open kitchen, which makes the room a flurry of energy even on a quiet afternoon. 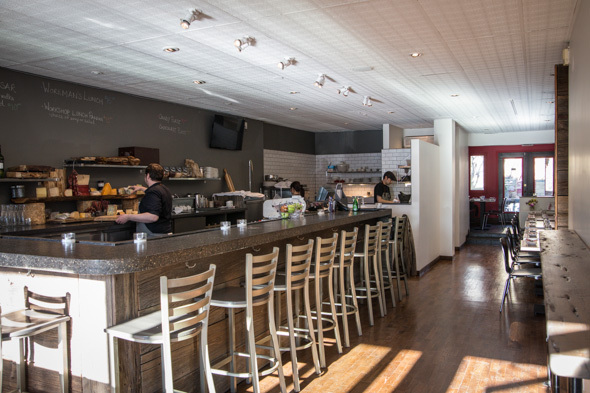 The bar menu keeps a narrow focus on wines and craft beers by the bottle or can. 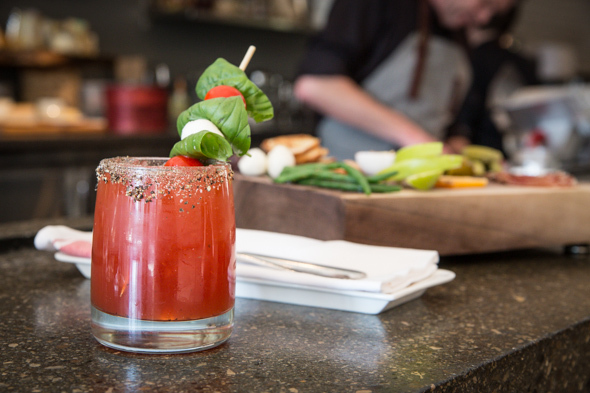 Cocktails won't play heavily into the line-up, though the Caprese Caesar ($10), made with house-infused basil vodka and garnished with a skewered salad, is set to be a fixture. 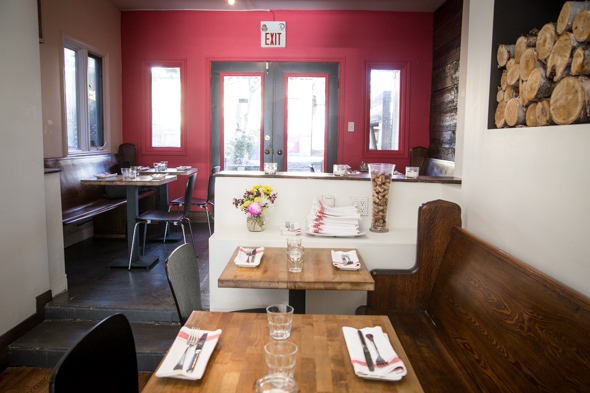 The menu is built around a thoughtfully curated list of provisions, cheeses, charcutes, preserves, and pickles. Cheese flights ($17) and a la carte cheeses are offered by weight from a fluctuating selection of 25, sourced mainly from the Cheese Boutique as well as other small batch suppliers. 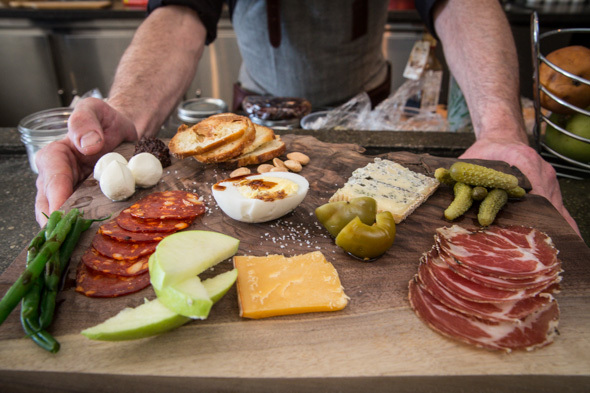 The bar seats are easily the best in the house, offering the opportunity to watch as wooden boards like The Workman's Lunch ($15) are composed from a pile of crostini, a couple of cheeses, meats, a creamy hard-boiled duck egg, pickles, nuts, fruit and grape-must mustard. During the day, the menu will change as frequently as the cheese roster, making use of slow-sellers in the daily lunch panini and soup ($13). 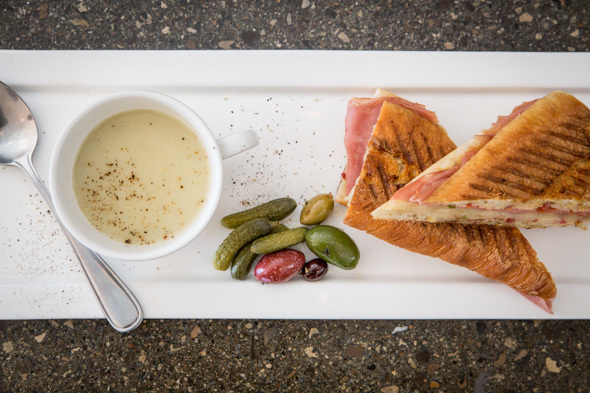 Today, the sandwich is built on a crusty Ubashi baguettes (the same as Mabel's carries), the filling is a sweet provolone with mortadella and olive tapenade, and the soup's a creamy potato leek with reggiano. Other cheese-centric dishes like pastas and risottos will find a spot on the menu too. 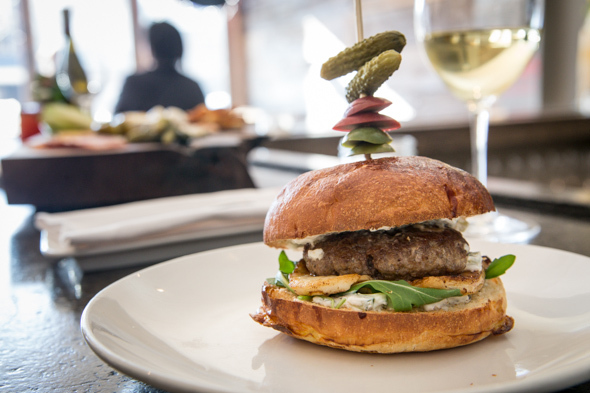 Today I'm fortunate to try a lamb burger ($9) layered over a disk of fried halloumi, topped with minty goat yogurt raita and sandwiched in a delicate toasted milk bun. 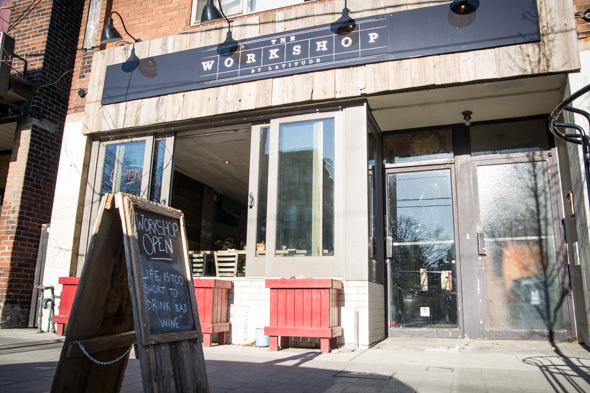 The Workshop by Latitude is open Tuesday to Sunday from noon until about 11 p.m. A glorious backyard patio will be put to use in the summer for Sunday afternoon BBQ sessions while guided cheese courses will be launched at some point too.